A DRIVER put his ex girlfriend in danger during a fit of jealousy as he believed she was on her way to see another man. A court heard Oscar Hines drove his Seat Ibiza with the victim hanging out of the vehicle as they grappled over her handbag. 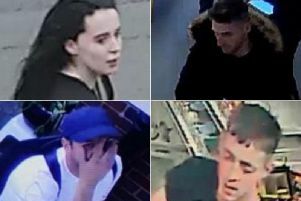 CCTV footage captured the incident which happened on Merrion Way in Leeds city centre on May 21 this year. Robert Galley, prosecuting, said Hines and his partner had been in a relationship for two years but spilt up around a fortnight before the incident. Hines offered the woman a lift into Leeds city centre after seeing her at a bus stop. Mr Galley said she accepted the offer as she thought it would be a good opportunity to say goodbye and apologise for the way their relationship had ended. Leeds Crown Court heard they argued during the journey and she got out near to Leeds Arena. Members of the public came to the woman’s rescue. Mr Galley said the woman was frightened and feared she would be hurt. Hines, of High Moor Grove, Moortown, pleaded guilty to dangerous driving. Hines told a probation officer he was sorry for his behaviour. He said he was jealous when he saw overnight clothes in the victim’s bag and thought she was going to stay with another man.